I spent the summer of 2003 working and living in Boulder, Colorado. My coworkers were keen to check out a Mexican food restaurant on Pearl Street. “It’s so good!” everyone kept raving. I then did the ultimate test and consulted a fellow Texas Ex-pat (otherwise known as a Tex-pat) who swore it was true. So I went. What I found on my plate was barely edible. Hard tortillas sprinkled with burnt cheddar cheese and a few chewy shrimp tossed on top. Avocado-like sauce that was labeled as guacamole. I brought this data back to the Tex-pat “Well, I only really drink the margaritas there,” she confessed. She could have told me that from the start and saved me the disaster on a plate. This experience was just prepping me for the severe Mexican food I would find in Europe. 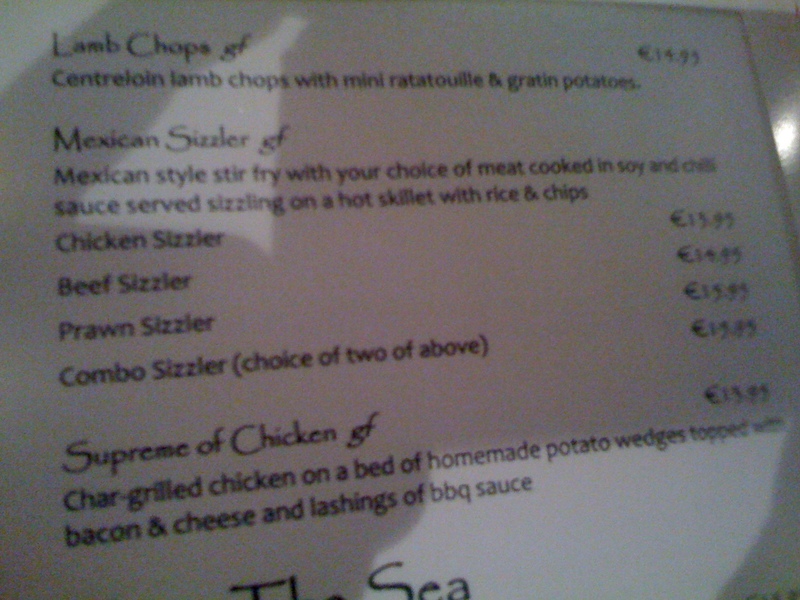 I found this gem in a hotel restaurant in Foxford, Ireland last month. Cooked in soy? Served with rice and CHIPS ? That’s french fries, you Americans. Cost €14-€16? Um, no thanks. Future Tex-pats, stock up on tortillas now and consider yourself warned.